Val Gardena can be reached using the Brenner Motorway (A 22). Coming from the north, follow the route Innsbruck – Brennero – Chiusa. Coming from the south, follow Verona – Trento – Bolzano. Take the Chiusa/Val Gardena exit. 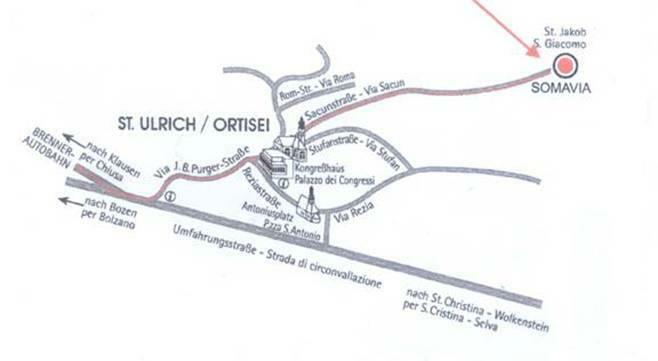 Following the well-marked roads, you should reach Ortisei in about 20 minutes, our apartments are located 1,5 km from the center of the village. To reach Val Gardena there are good IC and EC connections from Germany, Austria, the Netherlands and Belgium, stopping in Munich, Innsbruck, Brennero, Bressanone and Bolzano. The nearest airports are located in Innsbruck, Verona, Munich, Bergamo and Milano.